Everyone’s favourite smarmy doctor is back and donning his board shorts. Dr Love is on vacation and the psychedelic practitioner has money to spend on this 5 reel online slots. Join him and his red-headed nurse to combine your bonus round winnings to win a jackpot. Aside from this game, you can also try some of our UK video slots. The slot games developer team in the NextGen Gaming Company is packed with creative and original game design ideas, delivering innovative products to the market. With the knowledge of almost two decades, NextGen Gaming never fails to develop extraordinary entertainment products of a high-quality standard. Their repertoire has grown massively over those 20 years offering a wide range of different themed games to their audience. NextGen Gaming has become very popular amongst their players as they always provide new exciting spin slot games. If you have played the original Doctor Love online slot and enjoyed it then you will definitely love this one, too. It is very similar in style but this time the location has changed as Doctor Love has gone on his well-deserved vacation to an exotic Island. You can see a beautiful beach in the background and a dangerous-looking volcano, but don't worry it is far away and you can sit in your comfortable spot underneath big palm trees and enjoy your game. All credits to the developers for delivering the best slots games like this one! On the five reels and three rows you will find all the items to make this holiday complete: a delicious cocktail, the doctors stethoscope to listen to all the hearts he is going to conquer, a comfortable deckchair, a big suitcase filled with stickers of all the places Doctor Love has visited, a beach ball, an aeroplane, a sunburnt tourist and a pretty female holidaymaker. 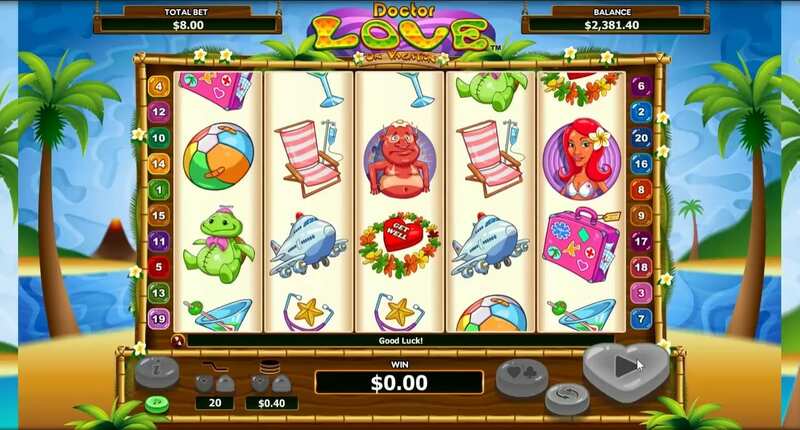 Doctor Love himself is the wild in this game and will double all your wins if he makes part of a payline. Look out for a yellow surfboard. This symbol is the scatter and the key to the main feature of the game. If you land three surfboards anywhere on the reels you will be awarded 12 free spins, four boards will grant you 16 free spins and five surfboards will give you 20 free spins. You can retrigger extra spins if you land more surfboards during the free spins period. What makes this feature so rewarding is the 3x multiplier that will be applied to all your wins during the free spin. If you land a wild in a payline during this period you will earn a 6x multiplier on your prize. If you still wish more features, Doctor Love on Vacation also offers a gamble feature. To activate it you have to simply press the “Hearts/Clubs” button after a win. You will get the chance to double or quadruple your wins if you guess right the outcome of the next card drawn. You can try this feature up to five right guesses. If you bet as little as 1p or up to 40 pounds you can buy yourself a ticket to join Doctor Love on his vacation and discover the 20 different paylines that are hidden amongst the beach. 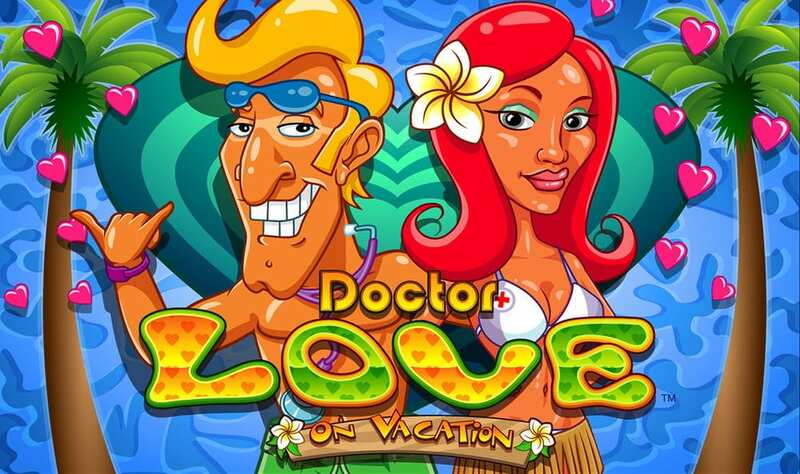 Doctor Love on Vacation is a simple online slot, yet it provides lots of entertainment and a nice time off in a beautiful sunny setting. The free spin feature is very rewarding with its 3x multiplier added to all of your wins. This game is a nice sequel to the original title and provides a nice new gameplay experience. 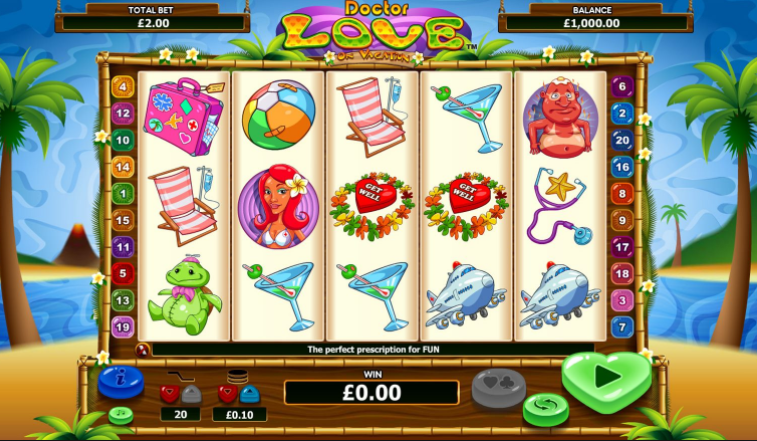 Doctor Love on Vacation is a relaxing video slot that offers a friendly game feel. Another smashing game to try is our gonzos quest slot.